Why do we celebrate Diwali? It’s not just the festive mood in the air that makes you happy, or just that it's a good time to enjoy before the advent of winter. 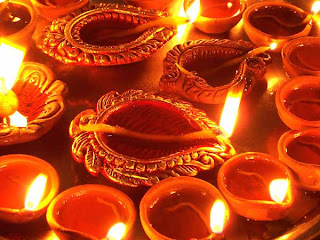 There are 10 mythical and historical reasons why Diwali is a great time to celebrate. And there are good reasons not just for Hindus but also for all others to celebrate this great Festival of Lights. 1.Goddess Lakshmi’s Birthday: The Goddess of wealth, Lakshmi incarnated on the new moon day (amaavasyaa) of the Kartik month during the churning of the ocean (samu dra-manthan), hence the association of Diwali with Lak shmi. 5. The Victory of Rama: According to the epic ‘Ramayana’, it was the new moon day of Kartik when Lord Ram, Ma Sita and Lakshman returned to Ayodhya after vanquishing Ravana and conquering Lanka. The citizens of Ayodhya decorated the entire city with th e earthen lamps and illuminated it like never before.